Paysafecard is a global leader in online prepaid card payments. You can use a paysafecard to buy at thousands of sites online. But you can also use it to fund your Internet slots play. paysafecard has gone through different hands in its brief lifespan, but most recently it was taken over by online e-wallet, Skrill. In 2015 it also merged with prepaid voucher firm, Ukash, to become a true giant of online payment processing. It provides anonymous payments for gamblers as you don't need to share card details with the casino. All that is required is a simple paysafecard voucher, purchased online or at thousands of participating shops. 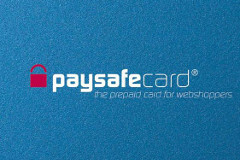 Based in Vienna, Austria, paysafecard was launched in 2000 to allow safe payments to be made online. It spread beyond its German and Austrian homeland since then, and in 2002 became an 'e-voucher' - a physical receipt that was available to buy online as well as in shops. UK customers were introduced to the service in 2006, and US residents four years later. A paysafecard app appeared in 2011, and by 2014, the service was available in 24 countries around the world. Skrill (formerly Moneybookers) took the firm over in 2013, while maintaining its unique voucher system. In 2015, paysafecard bought out rival prepaid voucher provider, Ukash. At time of writing, all existing Ukash vouchers were allowed to be used but they are no longer available to buy. Buying a paysafecard is as easy as finding an outlet that sells vouchers (the www.paysafecard.com website lists UK outlets). Supermarkets, petrol stations and newsagents are all on the list, so you won't struggle to find somewhere to buy one. Mobile users can also purchase paysafecard vouchers through the download paysafecard app. After buying a voucher, check your casino Cashier to see if they accept paysafecard deposits. After entering the amount you want to deposit and your password, you will be redirected to the paysafecard homepage where you can complete the payment. Simply enter the 16-digit voucher number and the amount will be transferred. Players can buy multiple paysafecard vouchers, and some casinos allow multiple vouchers to be used at the same time. Here's the downside: withdrawals to a paysafecard aren't permitted. Generally, the online casino will recommend a bank wire/wire transfer as an alternative method, and that's a solid option if available. paysafecard vouchers are available in £10 increments, but the slightly higher deposit minimum is offset by the processing fees - nothing. Casinos won't charge for using a paysafecard voucher, and funds generally appear instantly in your account. Alternatively, some nationalities can use a 'my paysafecard' online account to transfer funds. While deposits are instant, withdrawals via bank wire can take much longer. Players should expect somewhere in the region of 1-10 days to get their money transferred back to their accounts. The clout of Skrill behind it means paysafecard is now right at the forefront of online payments. And for casino players in jurisdictions where gambling is 'grey' or downright illegal, paysafecard offers a good way round the legal problems. As no credit or debit card numbers are shared on casino sites, the anonymity of paysafecard is a major plus. And of course, no processing fees is one of the best parts about using the deposit method. As we have mentioned, withdrawing is a big problem. And at casinos that operate a 'Net Deposits' system that restricts cash-outs to the method used for depositing, paysafecard might not be a good option. However, as long as you have a bank account linked to the casino, a straight bank wire is a perfect way of getting your winnings fast. Paysafecard has grown to become one of the biggest online prepaid voucher schemes in the world. As a result, 24 countries now participate in the scheme. Slots players from countries as far and wide as Argentina, Australia and Austria to Canada, Norway and New Zealand can buy paysafecards and use them to fund their gambling accounts. So far, however, we haven't discovered any regulated US sites that accept paysafecard. Paysafecard can also be purchased in a range of currencies, including USD, CAD and AUD.